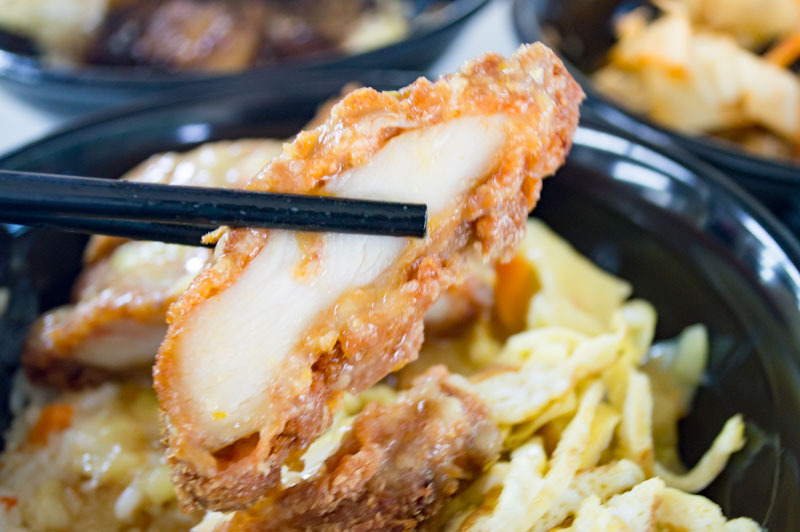 Looking for some cheap Japanese fare? 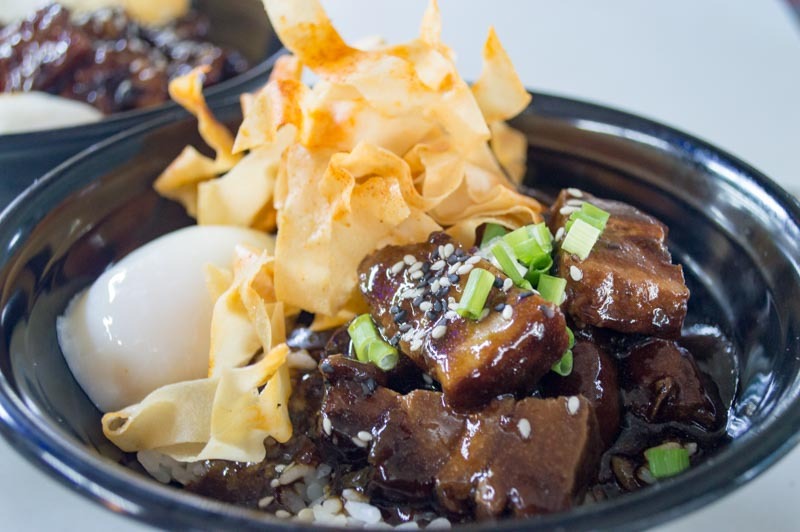 Bowl Chap in Ayer Rajah Food Centre serves up Japanese dons with local fusion flavours. The store is owned by a couple, Lee Jin Rong and Lee Pei Sin. The store name was actually inspired by Jin Rong’s mother. When he was younger, he used to have a “bo chap” (apathetic in Hokkien) attitude. 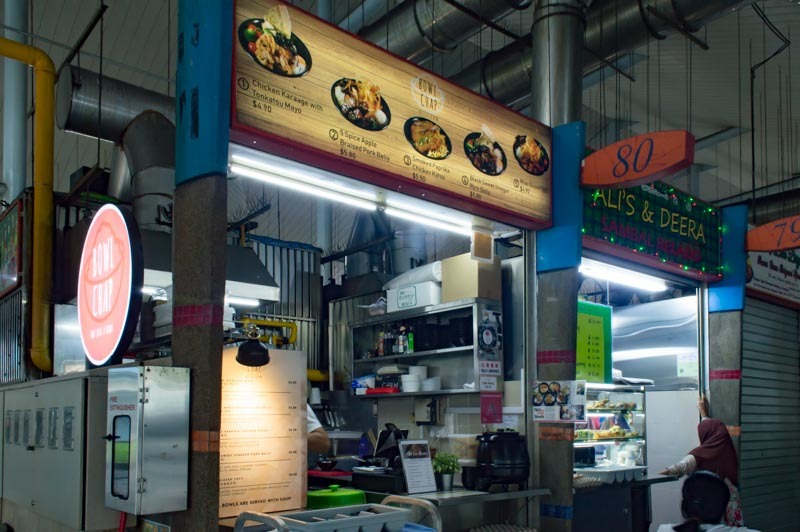 Located within a hawker centre, Bowl Chap’s dishes are quite affordable. Despite the low prices, Chef Jin Rong uses premium Japanese Koshihikari rice in each bowl. Every order also comes with a complimentary bowl of miso soup. Bowl chap has a simple menu with only five dishes, but you can be sure they do them well! I decided to try the 5 Spice Apple Braised Pork Belly (S$5.80). After lots of experimentation, Chef Jin Rong refined this method: he braises the pork with red apples and five spice powder, then leaving it overnight to marinate. The apple-infused marinade provided a natural sweetness to the dish, and I just couldn’t get enough of it! I was also able to taste the unique blend of star anise, cloves, Chinese cinnamon, Sichuan pepper and fennel seeds. Surprisingly, the flavours from five-spice powder didn’t overpower the whole dish. 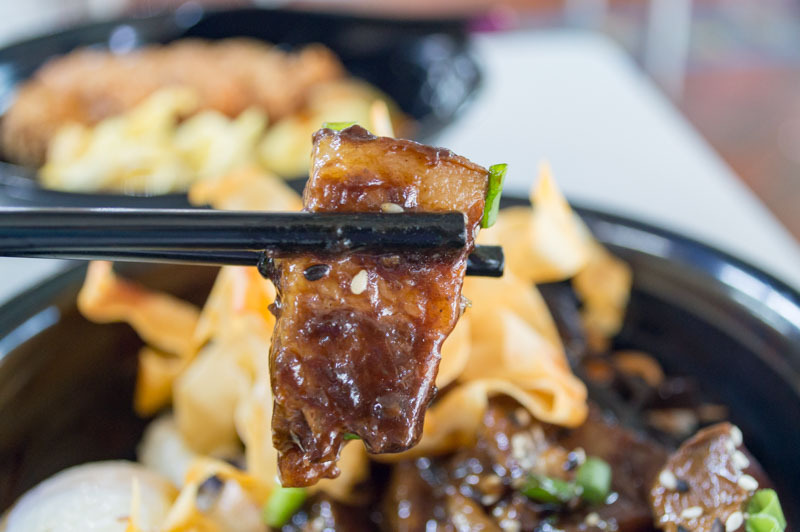 All the pork belly pieces used in Bowl Chap have an even fat-to-meat ratio, which caused the meat to melt in my mouth. They are also specially cut into bite-sized pieces so that it is easier for diners to enjoy. This dish comes with deep-fried strips of popiah skin that were carefully torn by hand. These were coated with smoked paprika powder, but slightly bland when eaten by on its own. However, the strips added a nice crispiness to the dish. Beneath the deep-fried strips, there were also black fungus and carrot strips simmered in a soy-based broth. This helped to neutralise the rich flavour of the pork belly, giving the dish a more refreshing taste. The perfectly cooked onsen egg added a creamy and richer mouthfeel. The next dish I had was the Black Sweet Vinegar Pork Belly (S$5.80), which was inspired by the black vinegar pig trotters that Chef Jin Rong’s mum used to cook when he was younger. Like the 5 Spice Apple Braised Belly, he cooked the meat overnight so that the vinegar could be infused into the meat. This dish was an acquired taste, but I really enjoy sour dishes so it was perfect for me. The acidity of the vinegar made my mouth water, opening up my appetite and making me want to eat more. It came with Chinese spinach and cherry tomato, mixed with minced garlic and Japanese sesame, which increased the roasted flavour of the sesame balancing out the rich aroma from the pork. 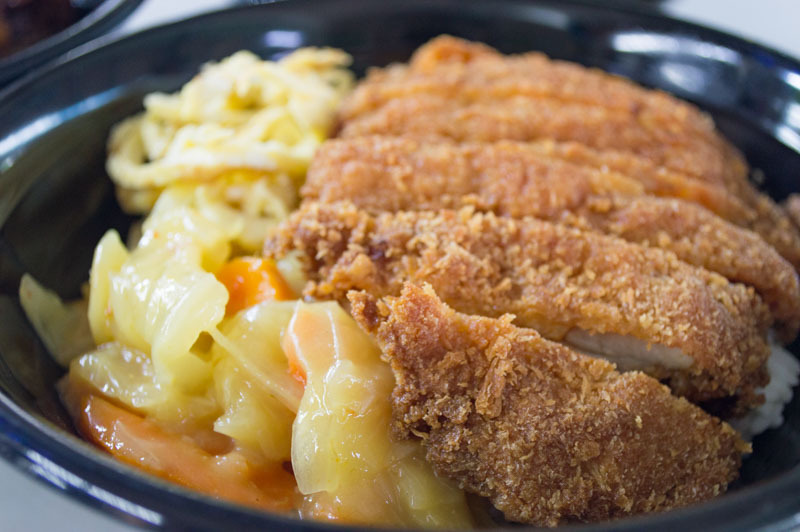 The Smoked Paprika Chicken Katsu (S$5.50) is a fusion of Spanish, Mexican and Japanese cooking. Marinated in smoked paprika, the chicken is then lightly battered and deep fried till golden brown. Despite the dry batter, the chicken meat was glistening with juices. The smoked paprika added a slight fiery and smoky taste after each bite, a flavour that isn’t commonly found in Singapore. To add on to the spice, they also drizzle sayur lodeh, an Indonesian curry vegetable soup with vegetables, long beans, and tofu on top. The sayur lodeh came with a side of chap chye cooked for three hours. To balance out the rich flavours from the chicken, Bowl Chap also adds some shredded omelette to the dish for more texture rather than taste. To get the best out of the bowl, mix all the ingredients together. 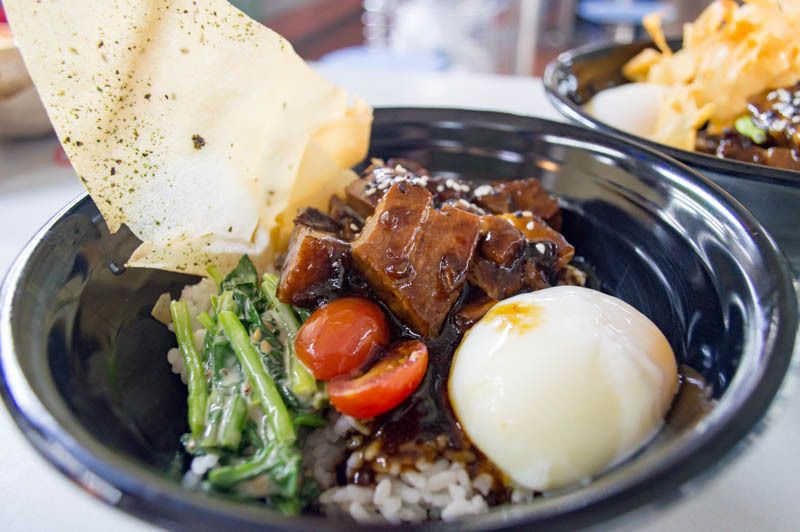 Bowl Chap serves a different type of donburi with a local twist, so you should head over to Ayer Rajah to experience their unique menu. With their affordability and sizeable portions, I would definitely want to visit again.